Interesting option to invest some time swimming in Genthin. Is it not your first time here? Tell us how it went using the Facebook comments below or contacting us directly! 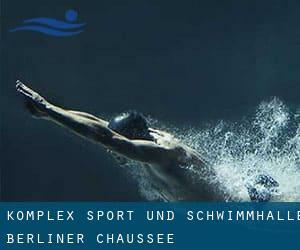 Komplex Sport- und Schwimmhalle Berliner Chaussee is only one of all the swimming pools Swimia is offering you, and its information has been shared with us by a swimmer like you.Remember you could now promote Komplex Sport- und Schwimmhalle Berliner Chaussee by sharing this page together with your friends, adding comments and linking to us. This sports center gives 25 meters, Indoors. For this Pool, only phone number is number here. Updated on 2019 Albert-Schweizer-Straße 1 , Magdeburg , GERMANY (Postal Code: 39126). This sports center provides 25 meters, 4 lanes, 2 meters -3 meters depth, 2 meters -3 meters depth, Indoors. Contact info for this Pool such as phone number and email address are number. Updated on 2019 Kirchhofstraße 7 , Burg , GERMANY (Postal Code: 39288). Among all of the activities offered by the center, if you are thinking about swimming you can get pleasure from 25 meters x 12.5 meters, 1.8 meters depth, 1.8 meters depth, Indoors. If you need to make contact with this Swimming Pool, email address and phone number are both number. Updated on 2019 Im Stadtpark «Alte Bibel» , Bernburg , GERMANY (Postal Code: 6406). Among all the activities offered by the center, for anybody who is interested in swimming you will enjoy 25 meters, 5 lanes, Indoors. Just in case you need to contact this Swimming Pool before dropping by, we only know the phone number. Updated on 2019 Seegraben 7-8 , Aschersleben , GERMANY (Postal Code: 6449). Among all the activities offered by the center, if you are interested in swimming you can expect to enjoy 25 meters x 10 meters, 4 lanes, Indoors. If it is advisable to contact this Swimming Pool, email address and phone number are both number. Updated on 2019 Mansfelder Str. 50 , Halle , GERMANY (Postal Code: 06108). Swimmers like you reported 25 meters, 5 lanes, Indoors. Unfortunately we do not have the email address of this Swimming Pool, but we can give you the phone number. Updated on 2019 Virchowstraße , Magdeburg , GERMANY (Postal Code: 39104). Swimmers like you reported Olympic size x 20 meters, 8 lanes, Indoors. Phone number and e-mail address are number for this Pool. Updated on 2019 An der Schwimmhalle 4 , Halle , GERMANY (Postal Code: 06122). This sports center offers Olympic size, 8 lanes, Indoors. For this Swimming Pool, only phone number is number here. Updated on 2019 Klubhausstrasse 26 , Hettstedt , GERMANY (Postal Code: 06333). This sports center provides 25 meters, Indoors. For this Swimming Pool, only phone number is number here. Updated on 2019 Johannes-Göderitz-Straße 113 , Magdeburg , GERMANY (Postal Code: 39130). Swimmers like you reported 25 meters, 4 lanes, 2 meters -3 meters depth, 2 meters -3 meters depth, Indoors. Phone number and e-mail address are number for this Swimming Pool. Updated on 2019 Lindenallee 11 , Graefenhainichen , GERMANY (Postal Code: 06773). Swimmers like you reported 25 meters, Indoors. Phone number and e-mail address are number for this Swimming Pool. Updated on 2019 Gebrüder-Rehse-Straße 12 , Halberstadt , GERMANY (Postal Code: 38820). This sports center offers 25 meters, 6 lanes, Indoors. For this Pool, only phone number is number here. Updated on 2019 Emil-Fischer-Str. , Leuna , GERMANY (Postal Code: 06237). Among all of the activities provided by the center, should you be considering swimming you will enjoy 25 meters, Indoors. Just in case you want to get in touch with this Pool before dropping by, we only know the phone number. Updated on 2019 Grosse Diesdorfer Straße 104a , Magdeburg , GERMANY (Postal Code: 39110). Among all the activities offered by the center, when you are interested in swimming you will enjoy Olympic size x 20 meters, 8 lanes, 3 meters depth, 3 meters depth, Indoors. If you must contact this Swimming Pool, email address and phone number are both number. Updated on 2019 Ratswall 9 , Koethen , GERMANY (Postal Code: 06366). This sports center offers 25 meters, Indoors. Contact information for this Pool which include phone number and email address are number. Updated on 2019 Leunaer Straße 38 , Merseburg , GERMANY (Postal Code: 06217). Swimmers like you reported 25 meters, Indoors. Unfortunately we do not have the email address of this Pool, but we can give you the phone number.